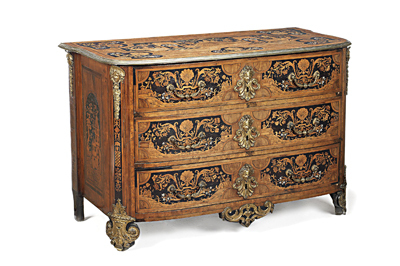 A chest of drawers, made in 17th-century France in the manner of Parisian cabinet-maker Thomas Hache, was sold on 23 July at the Bonhams auction at Trelissick House in Cornwall for £43,250. The auction presented a remarkable collection of lavish furniture and ornaments that each holds a piece of Copeland family history. The gilt-bronze beauty, standing at 1.3m high, appears to depict the events of the era within the painting on its D-shaped top, with images of a grand palace and courtyard with a striking garden scene. In the 1700s there was a change in French art, with the transition from pompous pieces to lighter, more intimate furniture. The crafting of furniture became more natural, with constant use of foliage, bouquets and ribbon designs. The designs were also a combination of rosewood (Dalbergia retusa), ebony (Diospyros spp. ), elm (Ulmus procera) and ivory to create a simplistic light and dark contrast, as seen on the commode. Commodes were very popular during this Revolutionary era as their representation of intimate living reflected the ideas of the time. The piece was made during a period of great change in France, most significantly, a shift in government. Louis XIV's death in 1715 left France in debt due to the late king's poor financial choices for the country. His son Louis XV, only a minor at the time of his death, was unfit to serve leaving Louis XIV's nephew Philippe d'Orleans as regent for the young king. While in power, Philippe created a state system, used from 1715 to 1718, in which government administration was run by councils instead of individual ministers or secretaries of state. The systme de Law, designed by Scotsman John Law, was also introduced, involving the use of paper money instead of metal coins as a way of facilitating trade and investment, and ridding France of its financial deficit. Trelissick House was bought in 1920 by former director of the Bank of England, Leonard Cunliffe. Cunliffe was known to be a successful businessman and familiarised himself with art, showing a strong interest in china porcelain collections and antique oak furniture. Generations on, and the 18th-century Grecian style home will be hosting an auction for Cunliffe's most prized possessions, including memorabilia and historical pieces owned by his descendants, the Copelands.